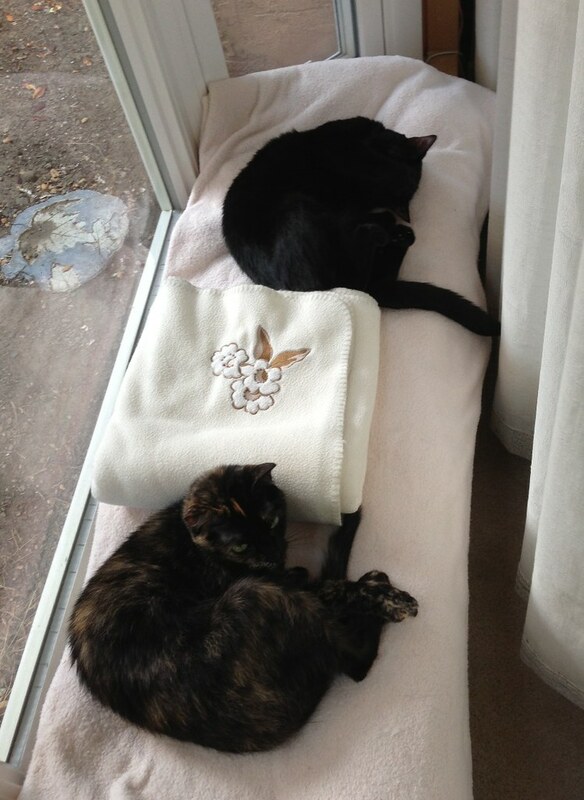 This entry was posted on July 25, 2015 at 11:45 pm	and is filed under Cats, Teagan and Nessa. Tagged: Cats, deformed toes, itchy, quarantine, ringworm, scaly skin, Wood's Lamp. You can follow any responses to this entry through the RSS 2.0 feed. You can leave a response, or trackback from your own site. Bless your heartS for being so kind to your new permanent fur babies. When we were fostering Tikka the Papillon, she had Giardia. It is 10 days quarantine and you can imagine that my dog wanted to meet her so very badly . Are two cats didn’t mind not meeting her. she was adopted so very quickly and we fostered her for17 days total. Our biggest hurdle with the dog was that she had severe separation anxiety. Keeping her apart from our dog was very hard but she could be with us without him around the rest of the time. My husband said he does not want to foster any more dogs because we don’t really have a good yard for it anyway. Awwww. I didn’t know you fostered a dog. I remembered when you fostered a litter of kitties. If I may say a few things about ringworm and the Woods lamp. First, let me say that I sell Woods lamps, not a plug for business, but just that I really know a lot about Woods lamps. So here goes, not all strains of ringworm show up, only about 70%. When it does show up, the color under the Woods lamp is an apple green. Ring worm is an issue. Your vet said he has only seen it once before. I sell a ton of lamps to vets, rescues and cat owners weekly. I have had so many pet owners ask me about ring worm that I have researched the subject and have all sites on file to offer to those in need of the info. Ha, I have even had calls about farm animals. This is the most important information that I have been trying to get out about the Woods lamp. (Whether it be for the care of animals or humans) One possible reason that when your vet used the Woods lamp to test for ring worm and it showed nothing is because the bulbs in the lamp were dead. The UV bulbs in the Woods lamps have a gas within them that makes things fluoresce. As time goes on, the gas in the bulbs dwindles. So less and less things fluoresce. Even when all of the gas in the bulb is gone, the bulb will still light. But nothing will fluoresce. Because the bulb still light, people think the bulbs are still good. But the bulbs are actually dead and needed to be changed a long time ago. I write about this problem on my website http://www.woodslamp.net/Effective-Life-of-UV-Bulbs.htm I realized that people did not understand about UV bulbs when speaking to a surgeon who did bowel reconstructions.. she had a Woods lamp with old bulbs and was checking to make sure the bowel was fully sealed after surgery. How scary is that? They don’t teach medical students about UV bulbs in medical school! So I guess they most likely don’t teach that in veterinary school either. Your vet most likely wouldn’t have taken kindly to you questioning him about his UV bulbs in the Woods lamp, but if the bulbs in the lamp were good, you may not have needed to have additional tests and expense. If anyone would like the links I have for the sites for ring worm, please let me know. I would be most happy to share. Thank you so much for your comment with such interesting information. It could have been the bulb was dead or it could have been that the strain was in the 30%. How does one know if the bulb is dead? Is there a way to tell? Again, thank you so much for taking the time to comment. Yes, you are correct, could have been the strain that doesn’t show up. You can’t tell with the naked eye if the bulbs are good or bad. We have a bulb tester that we ship with all orders. However, one way to see if the bulbs are good is to frequently check the lamp by shining the light on something you know fluoresces like makeup, anti freeze, skin care products with vitamin A. So as an example, vitamin A products show a bright yellow color, if the bulbs were dead, no color would be seen. Thought I would send these links about ringworm, they are a good read and very helpful. We have this saying in our house, “I know it is not there, so I can’t see it.” Sounds silly, but I believe it to be a very human thing. If you “know” something isn’t there your brain does not see it. Our vet – even though he is a good vet and I like him – didn’t really think it was a case of ringworm because he and the FIVE other vets I called (when first trying to get the cats in for a check) said ringworm is uncommon. So . . . with that said, it was a GREAT idea to get a culture and then treat accordingly. Thank you for the articles. I have an issue with the second one, though . . . in fact, most information I read about ringworm and its treatment had it wrong. Most article say that Terbinafine is VERY VERY EXPENSIVE. Because we were told by our vet that it is expensive BUT has the LEAST amount of side effects, I braced myself for a large prescription tab. I am not one to immediately take or give a drug as a solution to something so I am very leery of side effects, so of course I wanted the drug with the LEAST. But it was NOT expensive. I was shocked at how affordable it was. Perhaps in comparison to the other drugs it is expensive. And perhaps, when faced with medicating 25 shelter cats the need to go the cheapest route. But MORE side effects usually means more money in the long run. Anyway, we purchased 30 pills for $12.61. That is 60 doses. So, I hope that people do some research and decide for themselves if the prescription is “expensive” or not. To me, not having the risk of diarrhea or worse liver disease is worth it. Thanks again for the information, the articles, and for reading and commenting. You are great! Love your saying!!! You are absolutely right, that’s what people think “I know it is not there, so I can’t see it.” I have to say from experience with my business..ringworm is a serious issue, however people tend to think it is not there.. But you persisted and got a culture. Congrats to you!! I am a person who always asks questions…tons of questions… not worried about offending people for the truth/answers. Why don’t people go for the middle of the line and say “maybe” and then seek the answers/truth. So are you saying Terbinafine is a good deal? Also, please clarify your statement 25 shelter cats… are you the guardian angel for 25 shelter cats?? When I said to my husband, “I think there is something wrong with . . . ” he rolled his eyes, because I am always picking and poking at the cats. They have no voice. I have to be the one to recognize something is not right. The challenge is getting others (vets) to believe me and to figure it out and do something. I am a question-asker, also. I am saying that everything I read says that Terbinafine is expensive. Since I had heard that I thought the prescription would be expensive. But I personally don’t consider $13 expensive for a 30 days treatment. And that was to treat TWO cats. I am not the guardian of any shelter or foster cats. I was saying that perhaps having to medicate 25 cats with Terbinafine is considered expensive. And I said that because most of the articles I have read regarding ringworm were written by or directed to or had something to do with shelters. So if the article said Terbinafine is expensive perhaps that was because they had to obtain it for a lot of cats (I just used 25 as a the number). And perhaps the other drugs that are normally used are less expensive than Terbinafine. Because, honest, every article I have read said Terbinafine was expensive. So either the other stuff is REALLY, REALLY cheap or . . . I don’t know. But since I had heard “expensive” when we were getting our cats cultured, I was bummed. Because in the same breath I had heard “less side effects” and I was thinking, “Oh no. We just got these cats and they are going to cost us an arm and a leg.” Because, of course, I wanted the drug for them with the less side effects! After I read the second article you had pointed out, I was bringing up the possible idea that when people here “expensive” they might not research it and then just go with the “less expensive” drug that causes more side effects. I am often called to look for something that my husband “knows is not there” and it is right there. We actually often do that for each other. The brain is funny!